Bruegger's Bagels is special to me. I associate it with many moments in my life. When my husband and I were in our twenties, we would hit up Bruegger's Bagels every Saturday morning in downtown Royal Oak. The tradition of visiting Bruegger's was carried on with my oldest daughter. My husband would leave a bit early to take our daughter out to Bruegger's to grab bagels for a little one on one time before school started. So, when I was asked to check out the new fall menu I was excited. I've been suffering from a severe cold, thanks to back to school germs, and feeling quite grumpy. I was in desperate need of some comfort food. 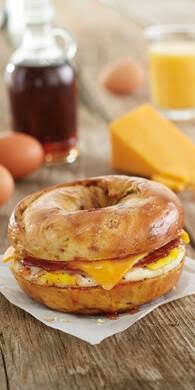 Therefore, I sent my husband on a mission to Bruegger's Bagels to pick up the new Mighty Melt from the fall menu. 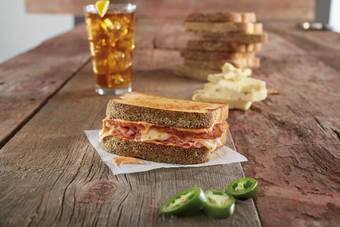 The Mighty Melt is a combo of ham, bacon, pepper-jack cheese, sriracha mayo on a buttered toasted jalapeno cornbread. The Mighty Melt is so tasty; I loved the melted cheese and the mixture of spices. Also, the jalapeno cornbread was unique and different. It was just what this girl needed to feel a little better. DALLAS (Sept. 13, 2016) – The 2,500-mile stretch of road from Chicago to Los Angeles, the famous Route 66, is the inspiration for Bruegger’s Bagels’ new fall menu, featuring items reminiscent of a small-town roadside diner breakfast or lunch, with a unique, craveable, Bruegger’s Bagels twist. The Route 66, with all the flavors of a classic American breakfast, starts with a fresh-cracked egg and piles on hickory-smoked bacon, cheddar cheese, and spicy Sriracha maple syrup, all served up on a new French Toast Bagel, with hints of cinnamon, maple, nutmeg, and vanilla. The classic combo of bacon, ham and melted cheese is at the heart of the Mighty Melt, featuring new hickory-smoked bacon, hardwood-smoked ham and pepper jack cheese with a kick of Sriracha mayo on butter-toasted jalapeno cornbread. 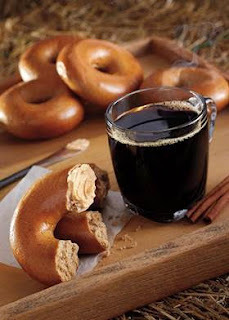 New bagels this season, in addition to the French Toast Bagel, include the returning Pumpkin Bagel, with its autumnal flavors and aromas of cinnamon, nutmeg, ginger, and allspice. Guests will have to wait until after Thanksgiving for the Orange Cranberry Bagel, with sweet orange and tart cranberry that evoke memories of holiday-season classics. Bruegger’s Bagels will complete the seasonal theme by bringing back its Pumpkin Spice Coffee. The fall menu will be available through Jan. 4, 2017, at participating Bruegger’s Bagels locations. 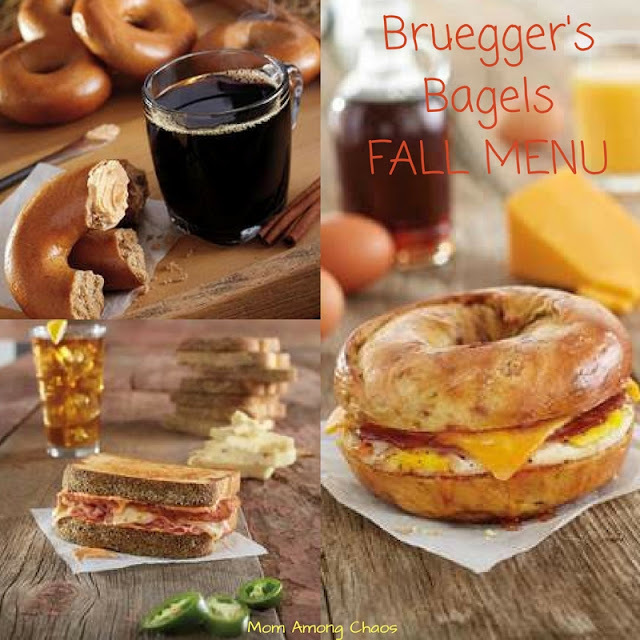 Should you try Bruegger's Bagels fall menu? Yes, just look at all of these yummy goodies, and they have the pumpkin spice bagels and coffee! Pumpkin spice is a magical word to so many people! So, gather up your family and head on over to Bruegger's Bagels for delicious treats and to create memories with your family.